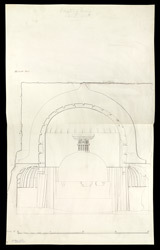 Ajanta: Elevation of Front of Cave X.
bl.uk > Online Gallery Home	> Online exhibitions	> Asia, Pacific and Africa Collections	> Ajanta: Elevation of Front of Cave X.
Elevation drawing of Cave X at Ajanta from James Burgess' 'Original Drawings from the Buddhist Rock Temples at Ajanta.' The magnificent cave temples of Ajanta are situated in a horse-shoe valley of the Waghora River in West India and consist of prayer halls (chaityas) and monasteries (viharas), built for the Buddhist community who lived there. The first group was excavated between the 2nd - 1st century BC. After a period of more than six centuries, the excavations restarted around the 5th century AD in the Vakataka period. Cave X is an impressive chaitya hall and one of the earliest excavations from the 2nd century BC. The interior is divided into three aisles by two rows of plain octagonal columns. At the end of the central nave there is a votive stupa. There are some traces of paintings preserved on the walls which depict episodes from the life of the Buddha.